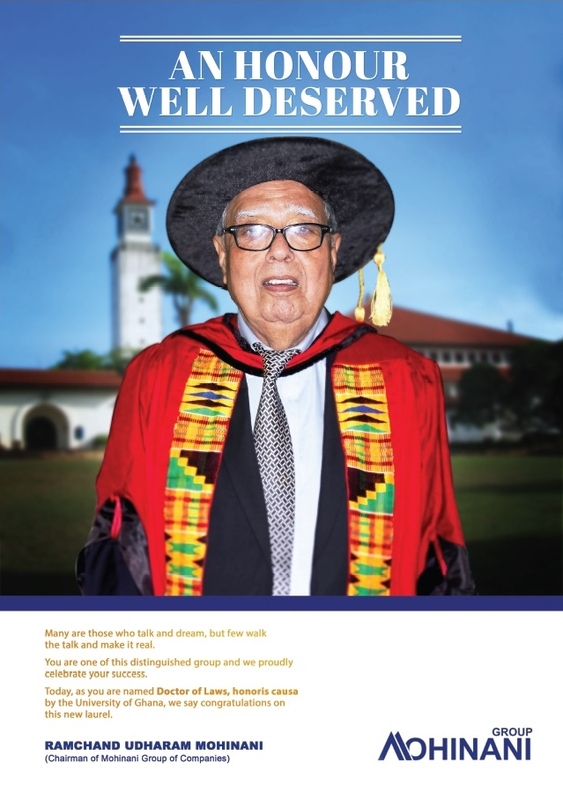 "Ghana’s premier higher institution, the University of Ghana has awarded an Indian-origin businessman Ramchand Mohinani with an honorary doctorate degree at a special congregation for his achievement in business in the African nation. In a citation, the university said the decision to honour Mohinani was in recognition of his hard work and for successfully establishing and managing businesses, as well as for his contribution to the economy of the country. His son Ashok told IANS that Ramchand was born in India on March 8, 1935 in Hyderabad and first arrived in Ghana in 1954 to join his uncle’s trading business. He later decided to start his own business and has not looked back since then. "In 1960, he formed a partnership with a Ghanaian businessman to establish a company dealing in garments, shoes and polythene products They parted ways after six years and he went on to establish Poly Products Ghana Limited in 1966," Ashok said. Ramchand started his first business with one machine and four workers near Mendskrom on the Kasoa road, near Accra. Today, the company produces packaging materials for the confectionery, soap, food and beverage industries in the country. The packaging materials produced by the company are also used in the agro-processing industry in the country."